When Sarasa Poduval was seconded to China, she became the first Department of Health (DH) civil servant ever to be seconded outside Europe. She is now Second Secretary, Health and Social Care in the British Embassy Beijing. She writes about what her adventure has taught her about China, the NHS and the importance of keeping your links back home. Recently, I had the unique experience of being seconded from DH to the Foreign and Commonwealth Office (FCO) to work in China for a year. But what on earth does health have to do with foreign policy? Well, it turns out that the NHS is one of the most respected institutions and most unique selling points of our great country. That respect buys us soft power to increase foreign trade and investment and improve our high-level bilateral relationships. We can use NHS experience to help other countries reform their own system through seeing how we run ours. Not only that, my secondment has brought 2 UK departments considerably closer, eschewing that common complaint of ‘silo working’. So you’ve been seconded to China. Now what? The first hurdle was the language barrier. I took 6 semesters of Mandarin for fun at university and developed a passable level of fluency. However, arriving in Beijing, I found that my skills were more than a little rusty. I gawped uncomfortably at impatient cashiers asking if we would like a bag for our groceries; mumbled at taxi drivers; and made full use of our interpreters at meetings with Chinese government officials. It was more than 3 months before the majority of my vocabulary came back to me – something I hope my beloved Chinese tutor, Li Laoshi (Professor Li) never finds out! When I arrived, preparations for the first UK-China Summit in 2 years were in full swing and colleagues were preparing for the visit of David Cameron and 5 other UK ministers – among them Health Secretary of State Jeremy Hunt. I’d arrived just in time to see health diplomacy in action at the highest levels. The summit marked the elevation of the UK and China’s health dialogue to Secretary of State level – previously, discussions had taken place between junior ministers. Jeremy Hunt signed a comprehensive Memorandum of Understanding (MoU) with Chinese Health Minister Li Bin, setting out the areas in which DH would collaborate with China’s health ministry (the National Health and Family Planning Commission, or NHFPC). China has achieved much in terms of health service reform, but acknowledges that it has far to go. Our Chinese colleagues hold the NHS in very high regard and feel that they have a lot to learn from us in many areas, including primary care and improving hospital standards. They aim to provide universal healthcare coverage by 2020; an impressive target. So far, the Chinese government has increased the rural insurance coverage rate from 3% to 90% in just 5 years, so they are right to be ambitious. Chinese health officials say that if they could buy the NHS wholesale, they would. 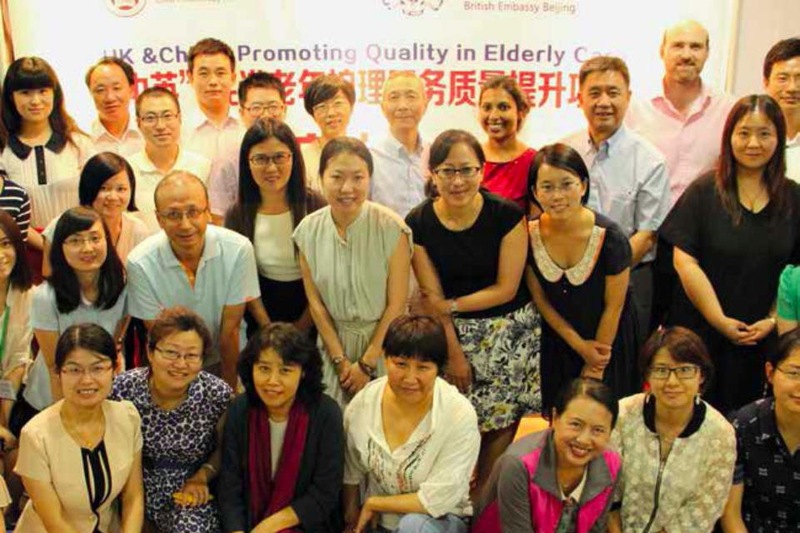 They see it as a ‘socialist’ model of care – fitting in with China’s political ethos. One of the many ways we use our experience to support China is through small-scale policy projects co-funded by the FCO and the Chinese government. These range from pharmaceutical pricing and distribution, to reforming doctors’ pay. These are hotbutton issues in China, but the UK is so experienced in these fields that few people stop to think about how our pharmacies get their supply of medicines, or which incentives motivate GPs. These small-scale projects also help us to build relationships with our opposite numbers in the relevant ministries. They boost the UK’s credibility, bring together experts and open up opportunities for businesses from both sides to work together. The Chinese government has accepted most of the recommendations so far – creating a positive outcome for its public healthcare consumers. Trade and investment between the UK and China also happens from the ground up. UK Trade and Investment (UKTI) and Healthcare UK work hard to match UK strengths with Chinese needs and have helped facilitate numerous partnerships - ranging from British companies implementing electronic patient records systems, to designing and building elderly care homes. And what of our interdepartmental collaboration? Thanks to my 5 years at DH, I’ve been able to bring a network of contacts to this role, enabling the team in Beijing to link directly with relevant policy leads or ministerial offices in London; and a strong understanding of the UK health and care system, so I can explain the role of DH and its various arm’s-length bodies to colleagues in the Chinese government. What have I learned? Going out on secondment, my objectives were rather broad. I wanted to learn about the health challenges China was facing, which were vastly different to the issues we would deal with at DH. I wanted to learn about the health diplomacy landscape and the opportunities for UK-China collaboration. I was also very curious to learn how the policy-making process differed from ours. On a personal level, I also wanted to learn how another government department worked, and to gain some new skills. I met these objectives and more. Perhaps the most important thing I learned was the importance of being anchored to Whitehall throughout. You cannot successfully represent UK policy without having your finger on the pulse of current Whitehall priorities. This requires excellent, proactive communication with all departments involved – sitting at a desk 5,000 miles away, we can be easy to forget unless we are in constant communication, joining video and teleconferences, and asking for regular updates. I also learned about the challenges of influencing another country’s policy, and how much depends on the UK’s reputation overseas. The opening of doors – both commercial and political – depends on it, something which UK civil servants are not always cognisant of on a day-to-day basis. It’s mind-boggling to think that the actions we take at DH which seem so UK-focused – legislation, policy, collaboration – can make an impact on a country like China – so huge, and ostensibly so distant. The secondment has been a unique opportunity for cross departmental collaboration and I believe, led to benefits for the UK Civil Service. For the team in the Embassy in Beijing, it has improved access to the relevant UK experts, who can then contribute to the FCO and China’s health policy objectives. DH can grow its influence abroad, particularly in a country where its expertise is so warmly welcomed. Chinese colleagues are always thrilled when they hear that DH has a secondee here in China – they view it as a sign of taking healthcare collaboration with China seriously enough to send out an “expert” (their words, not mine!). We’ve also been able to promote the view that UK departments do not operate in isolation and are a living example of ‘One Her Majesty’s Government’. I don’t want to overstate the benefits that a sole individual can bring, but I’ve been able to grow my own networks, both within and outside the Civil Service, and bring back new ways of thinking to DH and awareness of the impacts of our work, which will be hugely beneficial in my Civil Service career. Last but not least, the UK clearly benefits from equipping its civil servants with the knowledge and ability to deal with one of the most important countries now and in the future. I read this article with interest since my husband, a Department of Health (DH) civil servant for 30 years was offered a unique opportunity to work in the Qatari equivalent of DH (the Supreme Council of Health). He resigned from DH in order to take up the new role and is now working in the Supreme Council’s Programme Management Office, overseeing a portfolio of Public Health related projects, and working with some of the worlds’ most renowned experts in public health. I feel strongly that we shouldn’t underestimate how valuable and transferrable the skills we acquire as a civil servant are, not just across other sectors nationally, but globally. The UK Civil Service and the NHS are massively respected internationally and Government Departments and the Health Sector here in the Middle East are keen to embed expertise within their organisations and to learn from international best practice. I can only urge the Civil Service to develop HR policies which support staff to gain experience internationally so that staff do not have to resign in order to gain new skills and experience in other countries/cultures…and to bring that learning and those networks back to the Civil Service. Unfortunately in my husband’s instance, the view was that DH wouldn’t benefit from his move to Qatar. DH’s loss is absolutely Qatar’s gain.